It was the lovely scene between Hae Soo and King Wang So. We never thought Hae Soo would make Wang Soo do these type of things. She showed him few poems and ask him to rewrite them. King Wang So couldn't understand Hae Soo's motive neither we. At last we understand Hae Soo wanted Wanted Wang Soo to give him reply for the poems she wrote for him. After finish writing the poems Wang So sweetly argue with Hae Soo about her being lying that she will going to give him something after he will help her with things. But what she brought was just herbal rice. Hae Soo replied you ate it all as i prepared it to share it with Ji Monk and Baek Ah. Listening to it King Wang So become all jealous and told Hae Soo that she only need to focus on him and think about him. It was the second time we saw King Wang So smile so brightly and whole heartdly. Hae Soo also points out King Wang Soo's smile but he did not give her a clear answer as usual. Hae Soo ask the King top let her work at Damiwon as she has nothing to do accept wait for him all day long. But the king refused saying you won't be alone in the future as you will be taking care and raising our children. 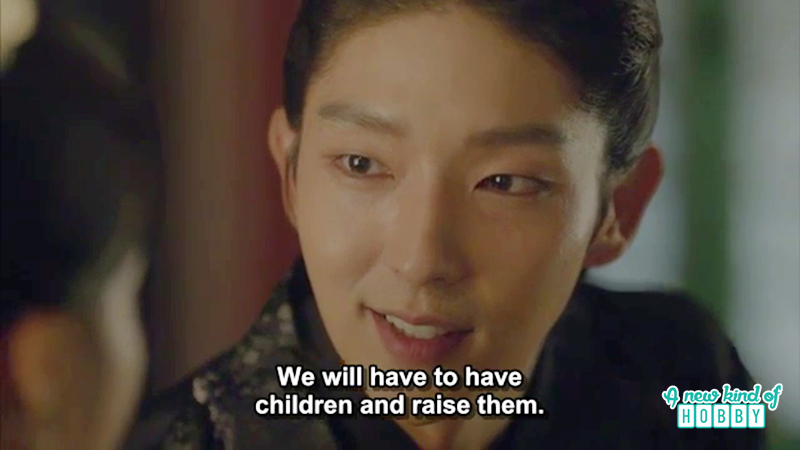 Oh man they even don't get married and King Wang Soo started planing about the children. Hearing this Hae soo was surprised and all blushed. Moreover King Wang So told her to take care of her health as doctor will come and see her. 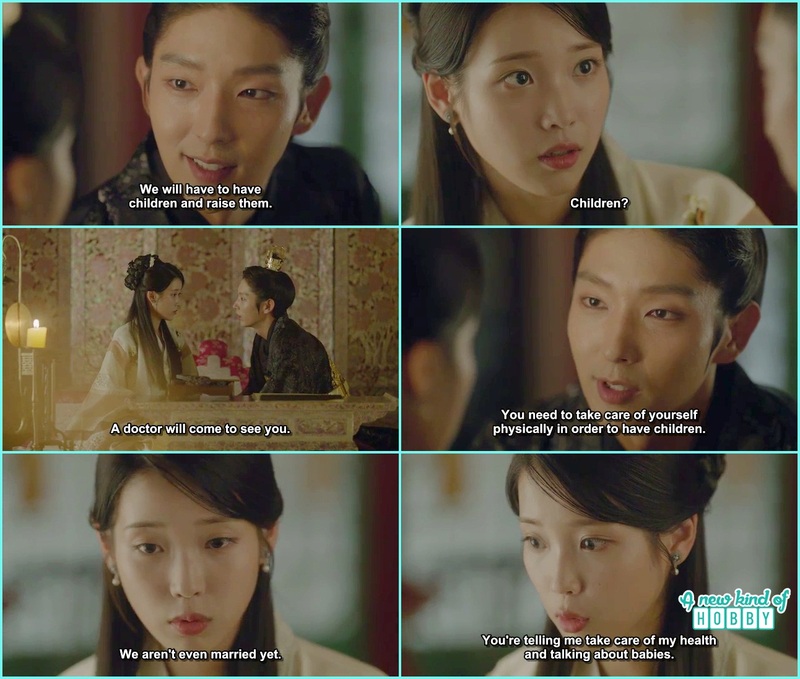 Hae Soo was confused she told the king that they both even didn't get married and he is asking her to take care of his health and talking about the babies. King Wang So was sure in a hurry so he didn't bother about marriage and wasting time and directly share his future plan to the girl he love. Listening to what Hae Soo mention he said its not a problem he is always ready for the wedding. Its up to Hae Soo when ever she want they can go with it. It look like Hae Soo is asking the King to take her to the amusement park. There conversation didn't end there as Hae Soo had many little arguments like an ordinary girl. The King even proposed her properly as she is being waiting since years. The king promised her to tell her something at the prayer tower but that time never come. 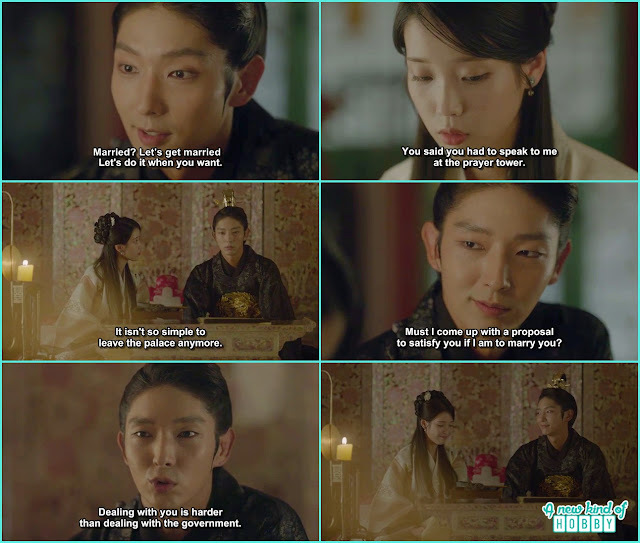 King Wang So was enjoying the conversation and innocence of Hae Soo and teased her that she still remember and waiting for the proposal and then realize that dealing with her is really hard then to run a government.